One Year Old and 4,000 Supporters Strong! 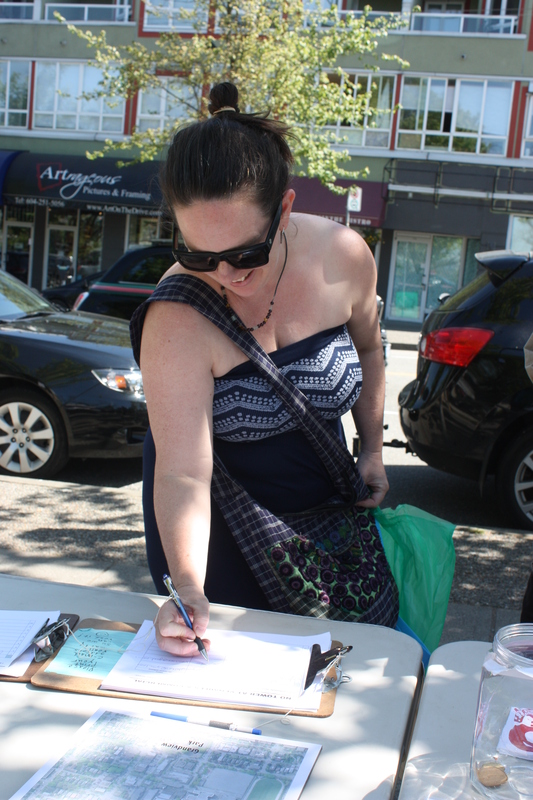 The No Tower Coalition has marked one year since it began a grassroots community campaign to develop alternatives to the massive multi-tower condo proposal at Commercial and Venables in Grandview-Woodland. The coalition now has over four thousand signatures on its petitions against the proposal and has recently released a video that outlines its concerns and proposes positive alternatives that meet the stated needs of the Kettle Friendship Society. The Coalition has a regular information table on Saturdays at Grandview Park. “This past Saturday was our best ever with 80 new signatures on our petitions, breaking through the 4,000 milestone” notes Cameron. “We are pleased to see the growing community concern.” More than 1,000 of these signatures have been added since the developers released their drawings of the proposal. The coalition has outlined many concerns about the tower proposal, including its massive density, negative impacts on the character of the Commercial Drive neighbourhood, upward pressures on land price, and the probable loss of affordable housing in the vicinity. While the Coalition has always supported the Kettle, it believes there are viable alternatives to the proposal, one of which would see the Kettle build a four-storey structure of its own on land on the north half of the site, provided by the City of Vancouver. The coalition also notes that there is new money on the table for affordable housing from the Province of BC, and possibly from the federal government, and there are several other recent examples of low-rise (four storey) social developments, which have partnered with the province and the City of Vancouver. These examples include an affordable housing project at 1700 Kingsway and the Firefighters Burn Fund building at 3891 Main Street. Here is the happy moment when the 4,000th signature was added to the petition. As you can see from the scoreboard on the right-hand sidebar, we continue to charge ahead toward a much higher level of support. Posted in Petitions, Statements on May 11, 2016 by jakking.